TULSA, Okla. – University at Buffalo men’s basketball coach Nate Oats pointed to his left at a pair of players who became the foundation of the Bulls’ most successful season ever. He considered what CJ Massinburg and Nick Perkins, two of Oats’ first recruits did to help build the program, and to set a standard. Then Oats, who took over the program in 2015, realized he has to figure out what to do without Massinburg and Perkins, who graduate after helping the Bulls complete their most historic season in program history. 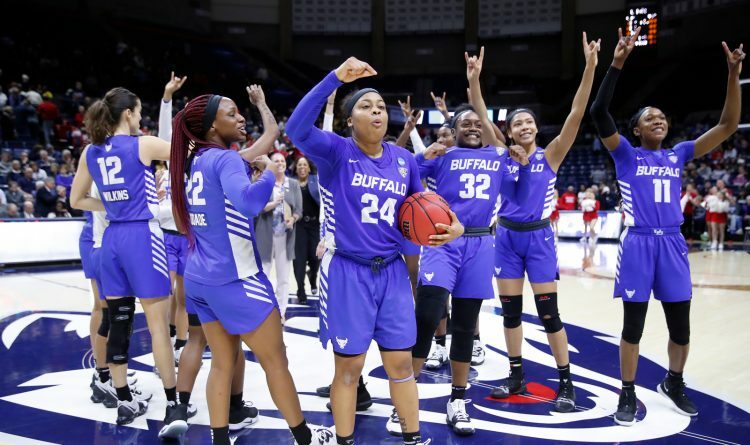 With Massinburg at guard and Perkins in the paint, the Bulls won their fourth Mid-American Conference Tournament championship, reached the NCAA Tournament for the fourth time in program history and set a MAC record for wins in a season. 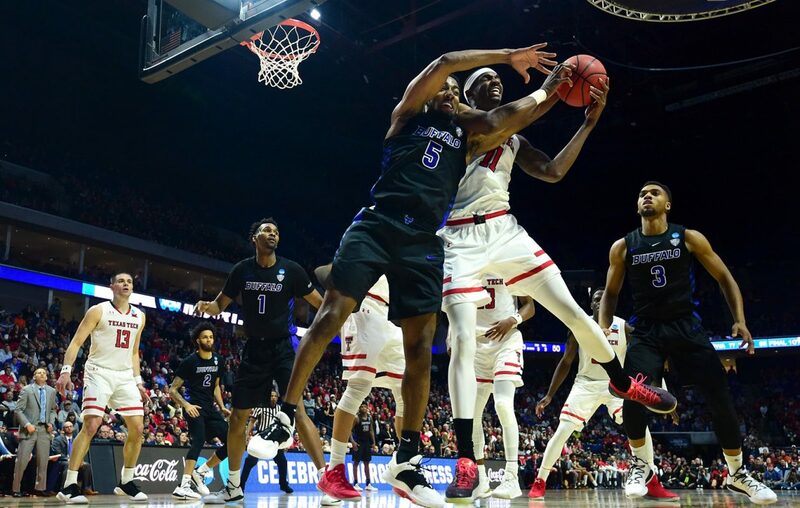 The most successful season in program history, however, ended with its most lopsided loss, and it’s not going to be easy for UB to immediately replicate the success of this year’s team, or its personnel, as it prepares for 2019-2020. The Bulls graduate five seniors, including Massinburg, who leaves as the program’s second-leading scorer all time (1,990 points) and Perkins, the three-time MAC Sixth Man of the Year. In addition to Massinburg, the Bulls will have to replace starting guard Jeremy Harris, who averaged 14.7 points per game in two seasons (1,062 points in 72 games), and starting forward Montell McRae. Off the bench, the loss of Perkins, a 6-foot-8-inch forward who averaged 12.7 points and 6.1 rebounds per game in four seasons, means the Bulls will have to cultivate its size inside. The Bulls also graduate guard Dontay Caruthers, a two-time MAC Defensive Player of the Year. But the Bulls won’t be fully green next season, starting with the return of starting guards Jayvon Graves and Davonta Jordan. Forward Jeenathan Williams and guard Ronaldo Segu played as freshmen this season, while sophomore Brock Bertram, a 6-foot-11-inch forward who averaged 3 minutes a game in 20 games, could take on a bigger workload with the graduation of Perkins. UB will add at least four recruits, including Noah Williams, a 6-foot-3-inch guard from Seattle, and three junior-college players: Andre Allen, a forward from Arizona Western College; Durey Cadwell, a guard from Daytona (Fla.) State College; and James Rojas, a forward from Hutchinson (Kan.) Community College. One more player could join UB’s recruiting fold: Raymond Hawkins, a 6-foot-9-inch, 225-pound center and a three-star recruit from California who plays at Findlay Prep in Las Vegas, will announce his college choice Saturday. He’s rated the No. 2 prospect in Nevada and the No. 21 center in the country by 247 Sports. Buffalo is in his final five, along with DePaul, Arizona State, Mississippi State and Arkansas. But the Bulls also will have to make up for experience, and not just on the court. Massinburg started 98 games and McRae and Harris combined for 144 starts in two seasons. Massinburg and Perkins, in particular, set an example for their teammates and for the program. Massinburg understands the brand he and the seniors designed for the program. “The five seniors, you know, no matter how bad your day is going, if you talk to one of us, you're going to have a smile on your face and your day is going to get picked up and turned around,” Massinburg said. “The city loved us for a reason, you know. We're always smiling and interacting with the fans, I just want people to remember that from our legacy.